Mary Hancock Hinds, author of the book Infinite Elvis; An Annotated Bibliography, THE reference source for Elvis books. David Neale of Elvis in Print for giving me the collectors virus. Niko Jutila for providing information and cover of the Finnish book Elvis! - Amerikkalaisen laulajan elämä ja kuolema by Peter von Bagh. Francesc Lopez from Elvisconcerts.com for providing front and back covers of some of the Spanish language books plus covers of lots of other books! Reynald for scanning the front and back covers of some French books: Elvis A. Presley: Mystère et Vie d'un Mythe by Marc Hendrickx, Elvis Et Moi by Priscilla Beaulieu Presley and Sandra Harmon, Le Monde d'Elvis: Elvis Au Pays Des Merveilles by Jane and Michael Stern, Unseen Elvis: Candids Of The King by Jim Curtin Elvis Presley by Marvin Israel, Sur la route d'Elvis by Patrick Mahé, Elvis Presley ou la revanche du sud by Sebastien Danchin, plus the cover of the 1984 edition of Elvis Recording Sessions by Ernst Jorgensen, the first "Sessions" book by Joe Tunzi, Elvis Sessions: The Recorded Music Of Elvis Aron Presley 1953-1977, the back cover of Elvis In Focus by Shean Shaver, the cover of the softcover edition of Shock, Rattle & Roll by Ger Rijff, the back cover of the softcover edition of A Life In Music by Ernst Mikael Jorgensen, the back cover of The Voice of Rock and Roll by Ger Rijff, the cover of Photographing the King by Shean Shaver, the original US edition of Echoes of the Past by Ger Rijff and Poul Madsen, the cover of The Legend Lives On by Paul Lichter, the cover of Encore Performance by Joe Tunzi, the cover of Growing up with the Memphis Flash by W.A. Harbison and Kay Wheeler, the cover of Long Lonely Highway by Ger Rijff, the cover of Elvis World by Phil Gelormine, the cover of Elvis, All My Best by Paul Lichter, and the cover of Elvis '56 by Alfred Wertheimer (1979 Ed. ), the cover of Elvis ... Through My Lens by Sean Shaver, and the cover of Elvis in Canada by Bill E. Burk. 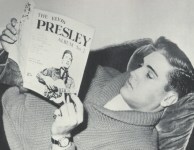 And all the people submitting comments on Elvis books!